Brr! Who turned off the heat? Who invited winter to come around already? I don't know about you, but I hate the cold! It makes me want to cuddle up in a blanket with a hot cup of something to warm my hands. And you know what else it makes me want to do? Eat warm, feeling, comfort food. And a lot of the time, comfort food does not necessarily equate with healthy food. So thanks to the polar vortex that is headed our way tomorrow apparently, I bring you a steaming hot bowl of faux-tato soup. 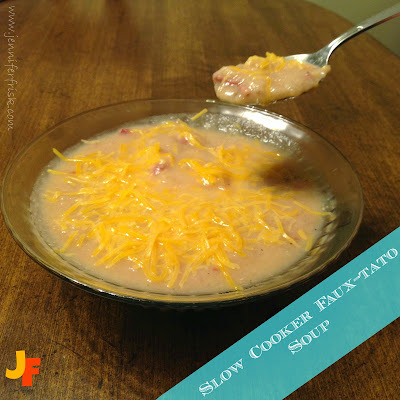 What is faux-tato soup? Faux-tato soup is all of the rich, yummy goodness of potato soup but without all of the starch and fat. Trust me, it will still hit that chilled-to-the-bone, why-doesn't-summer-come-back, please-something-make-me-feel-cozy spot. And in the vein of saving time, we use my favorite appliance for the winter months: the crock pot. Saute garlic and onion until translucent. Transfer to crock pot. Add cauliflower, broth, bacon, and milk. Stir in salt and pepper. Add yogurt. Use an immersion blender to incorporate ingredients into a creamy soup. 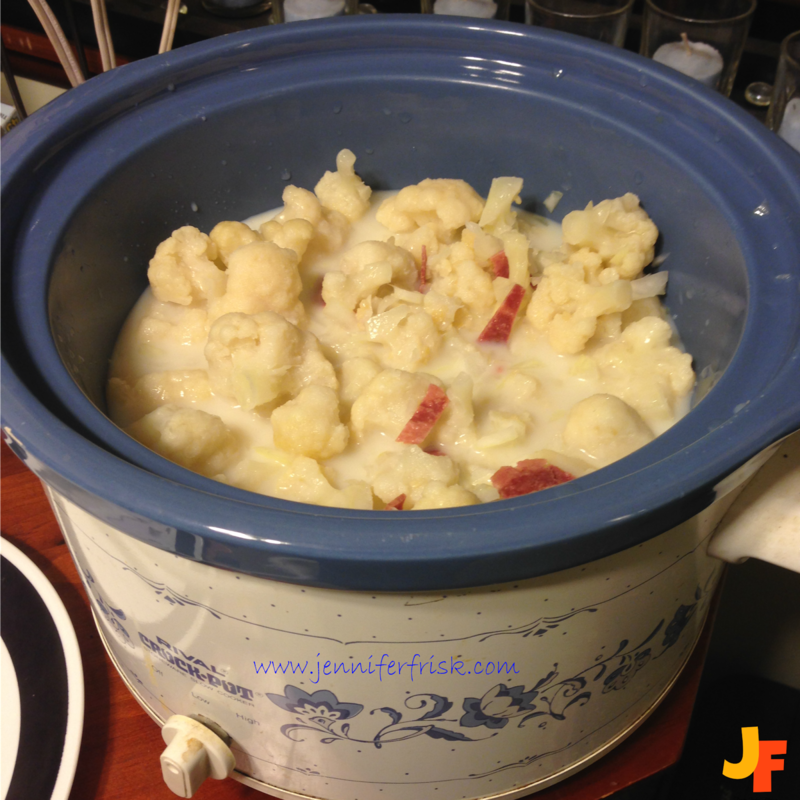 Be sure to leave some chunks behind as if there were chunks of potato! Serve with cheese for topping.